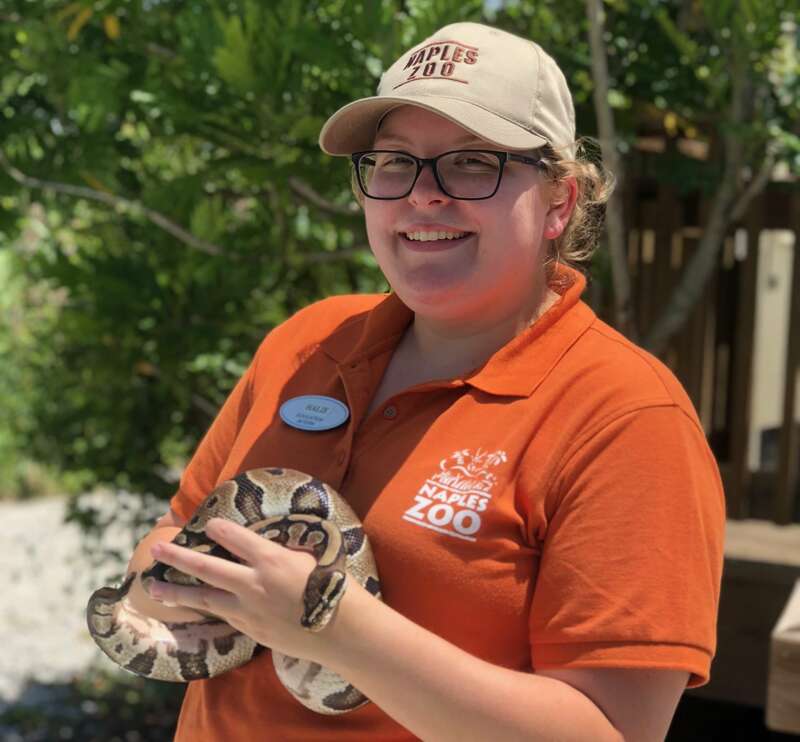 Naples Zoo’s internship program offers interns the opportunity to learn within a variety of disciplines, and the chance to obtain a unique and meaningful career experience in a beautiful setting with amazing animals. All internships are unpaid with no housing, stipend, funding, or sponsorship provided. Our Animal Husbandry Internships are designed to give college students, who are 18 years of age or older, the opportunity to have an in-depth, hands-on experience working in the zoo profession. All applicants MUST be doing internship for school credit or have just graduated with a degree related to the internship. Naples Zoo requires interns to work 3 days a week for a minimum of 10 weeks (at least 240 hours). An exception may be made if the circumstances warrant it, but should be discussed at time application is submitted. Related coursework or experience in area of internship. All Animal Care Interns are required to provide proof of a negative TB test. All Interns must pass a drug test prior to starting. Interns are required to complete 5 hours of continuing education opportunities during the semester. Continuing Education opportunities will be offered at the Zoo and may also include appropriate off-site opportunities. All interns must complete a project during their internship that is developed by the intern and the area supervisor. Internships are available in most areas for Summer (May-mid August), Fall (September-mid December), and Spring (January-May). *All other intern applications are due 6 weeks before the start of your internship. Not in school? We are also currently recruiting volunteers for many different areas! Unfortunately, we are unable to accept international interns because of a lack of funding. DOWNLOAD AND COMPLETE the Internship Application and submit with a resume and cover letter. EMAIL scanned applications to volunteer@napleszoo.org. After submitting ALL application materials, you will be notified via email or phone call as to whether or not you have been selected to move forward with an interview. Only a select few applicants will receive an interview and be selected as Zoo interns.Accepted applicants will complete an orientation (including passing a drug test, and turning in all required paperwork). Orientation date and time will be emailed to you.Schedules will be depend on area of internship, but candidates must be prepared to work weekends and holidays. Event interns will work evening hours as well.Thanks for helping Naples Zoo at Caribbean Gardens fulfill its mission!